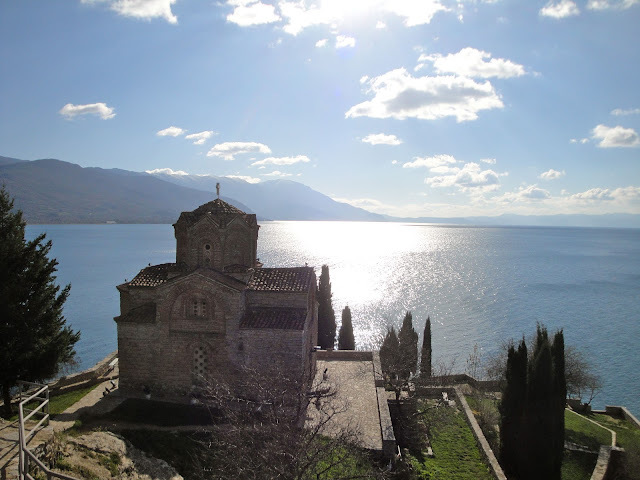 Saturday morning, we woke up early to follow a Lonely Planet walking tour of Ohrid that I copied down at the hostel in Skopje. 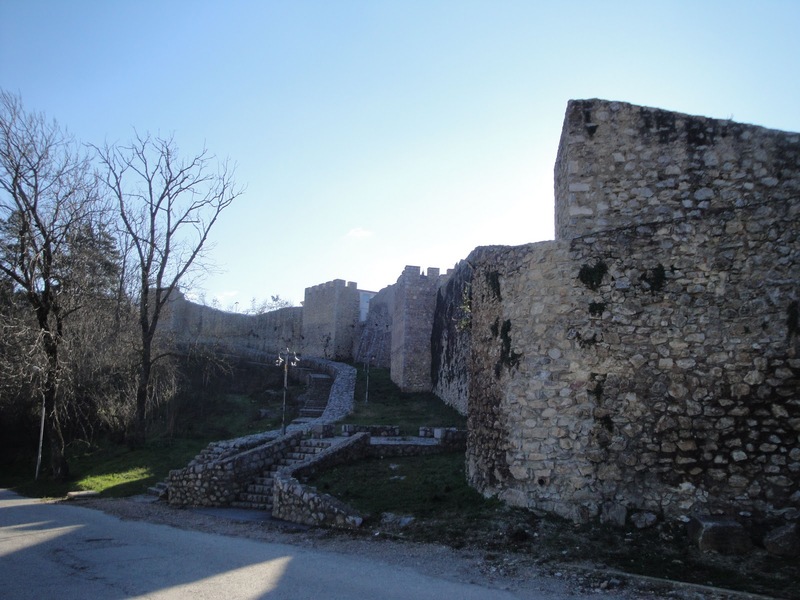 After a quick breakfast of toast and pancakes, we took a taxi to the gorna porta to start our tour. 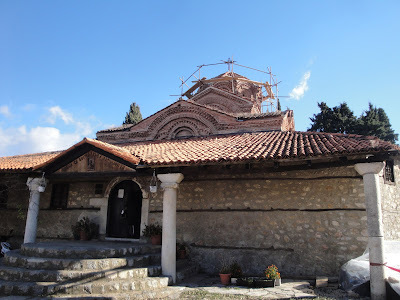 The tour continued with a church near the Upper Gate called St. Bogorodica Perivlepta. This church was built and painted in 1295 and was dedicated to Mary. When we entered, we were given an excellent tour, in English, of all the paintings by a woman who had done her PhD on the church. She explained all of the images in the church, as well as what aspects made it similar to other churches in the Balkans and those aspects that made it unique. There was a story circling the interior of the church about the life and death of Mary. This is part of the Apocrypha, so it was a new story for me. There was also an image of God having two heads and breasts. Pretty radical. She finished the tour explaining her own worldview, which was basically loving the world and its creatures fully. Following the true message of loving your neighbor as yourself. How have so many churches throughout history distorted this message so radically? Unfortunately, we were not allowed to take pictures of the interior. 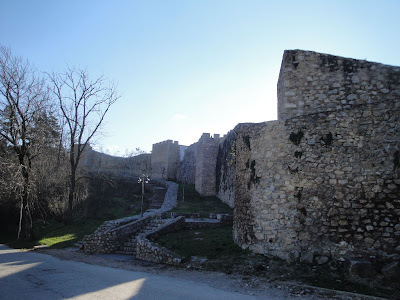 The tour continued up to the main fortress, pass an amphitheater, and then started to wind back down the hill toward Lake Ohrid. Halfway down the hill, we came to another church: St. Pentelejmon. This is a re-construction of the original church erected by St. Kliment, who is now interred in the church. St. Kliment was a pupil of Saints Cyril and Methodius, and the inventor of the modern day Cyrillic alphabet. After paying our respects to Kliment, we split off, with the girls heading back down to the city, and BH and I finishing the tour. The tour brought us to a cliff over the lake with fantastic views of St. John Kaneo church. The church itself wasn't amazing, but look at this view. The tour finished with some views of the old town along the lake, and we ended up back at the restaurant we ate at the first day. BH and I had some cake, did some Christmas shopping, and before we knew it, it was time to go back to Skopje. 5 hours later, and we pulled in to the bus station and met up with two of BH's friends: Radmila and Zoran. They were sister and brother, and both Deaf. Somehow, they ended up at the same hostel as us, so we went back to our rooms, unpacked, and then went out for dinner at a decent restaurant downtown (Trend). Tapas was followed by a visit to the Deaf club. 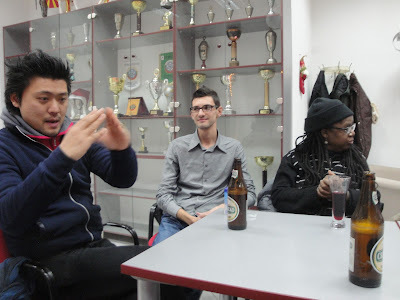 We had a great time meeting some of the Deaf Macedonians, and all four of us felt very welcome. We spent some two hours just trying to chat, using a mixture of ASL, Bulgarian/Macedonian, and charades. Since it was Saturday, we wanted to go clubbing, so we went on a search. We found this club called Papaya, and Radmila wanted a discount for the Deaf. Since we were foreigners, we eventually all got in without a cover. The club was a little boring, however, so we continued on to 69 Club. Once again, by being adamant about a Deaf discount, we got in for free, and entered the loudest club I have ever been to. You could feel the music in your entire body. It must have been great for BH, Radmila, and Zoran, but my ears were hurting. Couple of drinks and a couple of hours later, we went back to sleep at our hostel in Skopje.